A 20 sec video is viral in which a man has caught fire and few are trying to help him, while others have panicked. 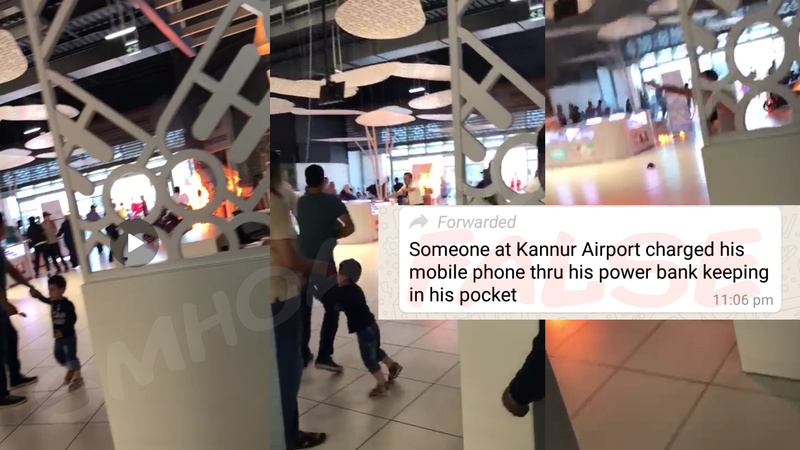 “Someone at Kannur Airport charged his mobile phone thru his power bank keeping in his pocket” is the text along with the video. The video is claimed to be from Kannaur Airport and said that the man caught fire from the Power bank which was in his pocket and from which he was charging his mobile. The man was a thief and set himself on fire in a shopping mall in Agadir, Morocco, Africa in June 2018. Rabat – He has succumbed to his injuries. The 30-year-old man who set himself on fire at the main entrance of a supermarket in Agadir on June 3 died Sunday, June 10, in the Mohammed VI Hospital of Marrakech, according to Alyaoum 24. According to the local news site Agadir24.info, the man had a criminal record, as he first entered the Marjane mall on Sunday, June 3, to steal. He was caught in the act of shoplifting. Once the stolen object was paid for, he left the store, only to return later in the afternoon with a flammable product. The man attempted to commit suicide, lighting himself on fire at the supermarket entrance. Authorities intervened, and the would-be shoplifter was transported to Hassan II Hospital in Agadir with second and third-degree burns on his face, neck, chest, stomach, and hands. He was later transferred to the Mohammed VI Hospital in Marrakech for treatment. A 59-second video of his act, taken by a customer, has circulated on social media, causing uproar among citizens. The man could be seen, on fire, walking into the supermarket, under the cries of visitors. Despite the panic, store security officers extinguished the fire. ← Missing Najeeb is not in the viral ISIS photo. It’s a Zombie Halloween Dress, not Syria !